In January, Pinterest moved their paid advertising platform out of beta. As early adopters, we were able to run tests with Promoted Pins to see if targeting, cost, and engagement could provide a meaningful channel for our clients. In fact, Pinterest Promoted Pins has been one of the fastest growing digital channels in our history, providing high quality traffic with measurable engagement. For at least one of our clients, Pinterest has grown to encompass over half their media buy simply because the numbers are so good. Direct Response in Social Media? Unlike many paid Social Media advertising programs, the visual focus and highly engaging nature of paid pins have led to performance not unlike direct response campaigns in Search and other highly-responsive media. This has meant rapid results and optimization of campaigns, which is not always the case in Social Media advertising. Where many Facebook and other Social Media campaigns may be challenging for direct response results, Pinterest can work quite well. We do note that it is early for Pinterest, and increased competition and Pinterest’s own efforts to increase bidding are likely to result in a more expensive channel in the future. While Pinterest provides high-quality traffic and direct engagement with Promoted Pins, it is worth noting that they also provide a high level of Out-Of-Channel activity. Out-Of-Channel activity simply means that there is a tracking disconnect between the exposure of the paid advertising and the actual sale or other engagement of the end user. With Pinterest, it is not at all unusual for users to see the domain name of the advertiser associated with the promoted pin, then come in through a Brand or No Referrer visit. It is important when evaluating Pinterest campaigns that the Out-Of-Channel lift be taken into consideration, as significant value is produced through Out-Of-Channel behavior. In tests done with online retailer Urbilis.com, we estimate Out-Of-Channel activity to be close to or more than the level of tracked sales. Out-Of-Channel activity occurs with any online advertising, and is related to the level of interruption of the media. Search, for example, has essentially no level of interruption and therefore low levels of Out-Of-Channel behavior. Pinterest, due to the nature of Pins and Promoted Pins, has surprisingly low levels of interruption compared to display, video, or even other Social Media advertising. With Urbilis.com we say Out-Of-Channel behavior as approximately 50% of the total value created by Pinterest. In display, video, or other more interruptive media this can be 90% or higher. Pinterest Promoted Pins allowed us to reach an audience far greater than our clients’ organic Pinterest campaigns. It has not been unusual for us to find that the volume of re-pins and clicks from Pinterest can be 10x t0 100x the volume of the non-paid Pinterest campaigns. This access to a significantly larger quality audience makes Promoted Pins highly valuable for clients in many vertical markets. Pinterest is a great example of the power in testing new media channels and programs. Digital marketing is a game of volume and math. Finding new and engagable audiences while controlling cost of customer acquisition is a key part of a robust digital program. Working Plant Co-Founder, Soren Ryherd, will be speaking at SMX Milan in November! Soren will discuss why Out-Of-Channel measurement is critical in to the success of CPA-based marketing given the high levels of out-of-channel user engagement outside of Search, as well as the increasingly common cross-device behavior seen in mobile search. SMX Milan will take place at the Meliá Milano hotel on Thursday and Friday November 12 & 13 2015. Please catch up with him after the session, if you plan to attend! We hear that often. But with digital marketing becoming more complex by the minute, what does the “next level” even look like? With cross-device and cross-channel behavior becoming more the norm than the exception, marketing programs that are siloed by channel are going to be increasingly inefficient. For example, Mobile ad exposure can drive desktop engagement. Video ads may well drive brand searches. But when value created in one channel is realized in another, it creates disconnects for budgeting and performance measurement. Striving for neat and tidy single-channel performance numbers is likely detrimental for your business. Marketers who break through to the next level are looking holistically at engagement across channels, across engagement points, and over time. Data-driven reporting, or simply looking at Google Analytics reports won’t cut it any more. Data used just for creating reports is data that is being wasted. True data-driven marketing feeds core metrics from advertising, engagement tracking, and customer databases back into ongoing optimization on a daily basis. “Next-level” data will focus on supporting complex modeling with hard data from multiple sources. The days of “do, measure, done” are gone. If you’ve been optimizing for marketing metrics without an underlying financial model, it’s time to step it up (take notice “Time-On-Site”). Marketing at its core is a financial investment in a financial outcome. “Next level” marketing is explicit about the financial model and how engagement and customer value support revenues and profits. To do this, Key Performance Indicators must be tightly aligned with profits. The ad dollars you spent today may have no relationship to the sales you made today unless you have the world’s shortest sales cycle. Today’s sales were likely to be largely, or maybe even entirely, from past advertising. Tomorrow’s marketing relies on predictive models that are savvy about time. An understanding of sales cycle, latency and engagement process is critical to the financial assessment and efficient optimization of your program. Yes, life would be easy if marketing were simple. 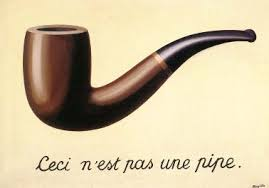 But today’s big opportunities in Digital lie in mastering complexity. The better you are at understanding complex user behaviors and tightly optimizing those behaviors for a clearly-stated financial result, the better chance you have to beat your competition. This means understanding the limitations of your ad management tools, reporting, tracking systems, and customer data and moving beyond those limitations. The “next level” is an exciting place. Welcome to it. Working Planet CEO Soren Ryherd recently took the stage at SMX Advanced as one of the “Mad Scientists of Paid Search”. 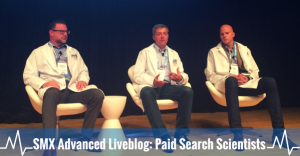 For the last nine years, SMX Advanced has showcased leaders in innovation in paid search on the Mad Scientists panel, one of the main stage events at a conference focused on advanced trends and tactics in digital marketing. Soren spoke about the increasing need for Out-Of-Channel measurement due to high levels of Out-Of-Channel user engagement outside of Search as well as the increasingly common cross-device behavior seen in mobile search. He particularly focused on the detrimental effects on CPA-based bidding systems when Out-Of-Channel effects are ignored. Soren’s presentation on “The Interruption Curve and Digital Optimization” can be seen here.